Every human being's good & bad deeds are accounted in the heaven.This is done by the God of Death Yama.He found the work load increasing due to the growing population.One day ,ashta dighbalar( in charge of eight directions)went to Mount Kailas to see Lord Siva.God Siva observed that all of them happy except Yama.Then God Siva asked Yama why he was in a sad mood.He complained to Him that he was unable to handle the accounting work of human beings & wanted to be assisted by someone who should be reliable & keep the records secretly with out disclosing to any one.God Siva agreed to this & told him soon he will be provided a suitable assistant.He immediately asked God Brahma the creator to do the needful to Yama.Brahma after certain thinking felt that only Surya Deva could provide such a clever person to assist Yama.He created rainbow before Sun & It became a beautiful lady &They got married.Soon a son was born to them with an everlasting accounting leaf (book) & a special pen in the Tamil month of Chithirai ,in the star of Chithirai & on a full moon day(சித்திரா பௌர்ணமி) . As he was born in in the star of Chitirai he is called Chitra putran. Gupta means one who keeps the secrets , So he is called Chitra Guptan.Surya made his younger son read all veda sastras thoroughly.After learning vedas to test his power gained from vedas,he started creating living beings.This came to the knowledge of God Brahma who in turn brought it to the notice of Surya Deva.Then Surya advised his son to stop creating work.He got him married & sent to his elder son Yama Dharma to assist him.Yama Dharma gave his younger brother recording of human' s good deeds & sins ,out of which Yama Dharma would act. 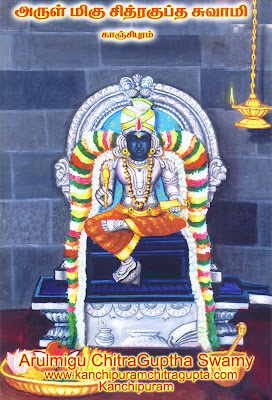 It is also said that he is born from a cow.On Chitra Pournami day it is said that he is visiting every human being' s house in the earth.So on that day people observe vradha & worship him.He is offered a cooling juice like liquid called " panagam" in Tamil. He is also offered tender co co nut, a palm leaf fan (விசிறி), mango,pulses,rice pongal,(உப்பு சேர்க்காத பொங்கல்).He is the Devata for planet Kedhu.worshiping Chitra Gupta would ward of kedhu dhosha in one's horoscope.Worsshiping Vinayaka also ward of this dosha.Chitra Gupta got this post after doing penance towards Lord Siva & got this boon. Very nice pictures, thanks for ur explanation, vratha how we have to follow on that day wt procedures we have to do, what mantras we can tel also explain me sir. If any festivals come I use to look ur procedures & I am following. Thank you Shankar Saranya.I have posted it to make it public & many may not be aware of such a vradha & worshiping of Chitra Gupta on full moon day of Tamil month Chitirai.My mother followed it & my mother in law also followed it in their family.Celebrating Margazhi Thiruvadhirai(For Lord Nataraja),Vaikunda Ekadasi &Thuvadasi,Vinayaka ,Chadurthi,Navarathri,Sivarathri,Deepavali ,Pongal & Veettu deivam(Sumangali pooja- This is most important for family welfare & Prosperity- This is for Sumangali ladies of their family who have done lot of hard work ,observing vradha,taking care of their children elderly, people, husband &they guide the family till their last breathe.So it is essential that we thank them by doing a pooja during pongal time for them. This is in addition to Family deity( Kula deivam) worship.If we neglect this,our children would be affected.We would also suffer.Don.t worry about manthras.Manicka vasagar told Thiruvasagam in Tamil & Lord Nataraja wrote it.Told by a devotee(man) & recorded by God.Shiva is so much happy to hear Tamil songs(devaram).You have the Interest(sraddha) & from young age onward, if we have this devotional culture,certainly your family as whole would develop.You can make certain options in following the festivals with your parents guidance.Wife & myself tradionally following Saiva religious path.I 'll write about the Chitra gupta vradha & add some maakkolam pictures with videos. Thanks a lot sir, I told this story to everyone in our family, neighbours house I felt happy. Thank you for guiding me. Thank you.Sharing sacred messages would bring us lot of blessing from God.My Guru ,Thiruvotriyur sanmarga sanga trustee once gave me life history of a siddhar & asked me to read it.When i returned it,he asked me if i had any good thing after reading it, I really had on offer to take a part time teaching class in a higher secondary school at north Chennai. This is my first time visiting ur blog and i loved it mama and mami..very nice story and i will definitely share it with my family. Thanks a lot. மிகவும் மகிழ்ச்சி அடைகிறோம் .தொடர்ந்து பாருங்கள்.உங்கள் ஆன்மீக அனுபவத்தையும் எங்களிடம் பகிர்ந்து கொள்ளுங்கள்.உங்கள் குடும்பத்தில் பெரியர்வர்கள் ஆனைவருக்கும் எங்களது பணிவான வணக்கம். Thats nice, what history sir. Life history of Brahmendra Swamigal whose Jeeva samadhi is in "Narayana vanam" ,a short cut route from North Chennai to Thiruppathi.He predicted well in advance about people behaviour & life in this kali yuga.He has lived during British period & said to be alive for many hundred of years..துறையிது வழியிது துணிவிது நீ செயும் முறையிது எனவே மொழிந்த மெய்த்துணையே.உயிருள் யாம் எம்முள் உயிர் இவை உணர்ந்தே உயிர் நலம் பரவுக என்று உரைத்த மெய்சிவமே.This is a master piece(arutperunjothi ahaval)lines of vallalarin Thiruvarutpa.